Sinclair, America's largest operator of local TV stations, is in the spotlight after a controversial promo video went viral over the weekend. Some staffers say they're embarrassed by the promos and concerned about their own credibility as journalists. A few local anchors and reporters are even reacting publicly, risking the ire of management. But Sinclair senior vice president of news Scott Livingston is defending the promos as a "well-researched journalistic initiative focused on fair and objective reporting." Last month, at Livingston's direction, anchors at Sinclair's stations were required to read a script decrying "fake stories" and biased news coverage. Some of the language echoes President Trump's anti-media messaging. And it's written to make it sound like the opinion of the local anchors, when in fact it's a mandate from management. Concerned journalists contacted CNNMoney about the promos last month. When the promos started airing, the Deadspin blog produced a video compilation of the exact same script being read by anchors across the country, reiterating the robotic and manipulative nature of the message. "Everyone is really embarrassed after watching the Deadspin video," an employee at one of the stations said Monday. "For the record, the stories we are referencing in this campaign are the unsubstantiated ones (i.e. fake/false) like 'Pope Endorses Trump' which move quickly across social media and result in an ill-informed public," he wrote in Monday's memo. "Some other false stories, like the false 'Pizzagate' story, can result in dangerous consequences. We are focused on fact-based reporting. That's our commitment to our communities." Sinclair's critics -- and there are many -- see it very differently. They believe the company exhibits a conservative bias from the top down. On Monday morning, apparently while watching TV coverage of the controversy, Trump sided with Sinclair in a very public way. He tweeted that it's "so funny to watch Fake News Networks" criticize Sinclair "for being biased" and said "Sinclair is far superior to CNN and even more Fake NBC, which is a total joke." Mary Nam, one of the main anchors at Sinclair's powerhouse Seattle station KOMO, responded to the president's claim that the coverage is funny. "Actually, this isn't funny at all. None of it," she wrote on Twitter. "When media giants gobble up local news stations, there are repercussions." Nam also shared a critical column from The Salt Lake Tribune. The paper's TV critic, Scott D. Pierce, wrote in the column that "Sinclair is using the trust built by its local station to advance its political agenda." That's how some Sinclair journalists feel. They have shared their frustrations with CNNMoney on condition of anonymity for fear of being fired. Jobs in local TV can be hard to get and hard to keep, especially in smaller markets, where Sinclair is a force to be reckoned with. Some Sinclair staffers sought to distance their work on the local level from management's mandates. Bob Herzog, an anchor at Sinclair's Cincinnati station WKRC, tweeted to viewers: "This morning I am part of a five and a half hour newscast that was constructed by hard-working producers who have been in the room right next to me hammering away all night. Our local stories come from phone calls they've made, assignment editors made and/or from reporters who got out & put their feet to the street. Our national stories come from CBS News, CNN and, yes, our parent company. We have a lot of resources and do our best to use them to deliver the news fairly. I work with good folks here. That's all I've got for you." Most of Sinclair's stations are CNN affiliates -- meaning CNN shares content and resources with them and vice versa. Sinclair is trying to further expand its footprint by buying Tribune Media's portfolio of several dozen TV stations. The deal is currently awaiting government approval. A producer at WGN, one of the Tribune stations Sinclair wants to acquire, tweeted on Monday, "There is NO WAY any of our on-air anchors and reporters will read their scripted messages on our show. Chicago's Very Own, not owned." And Nam, the KOMO anchor, brought up the Tribune deal in her response to the president on Monday. "Since you brought it up first this morning," she wrote, "will your admin green light the Tribune buyout?" "I know many of you and your stations are now in the media spotlight after the launch of our corporate news journalistic responsibility promotional campaign. There is a lot of noise out there about our company right now, and what is lacking in that analysis is something we constantly preach; context and perspective. The critics are now upset about our well-researched journalistic initiative focused on fair and objective reporting. For the record, the stories we are referencing in this campaign are the unsubstantiated ones (i.e. fake/false) like "Pope Endorses Trump" which move quickly across social media and result in an ill-informed public. Some other false stories, like the false "Pizzagate" story, can result in dangerous consequences. We are focused on fact-based reporting. That's our commitment to our communities. That's the goal of these announcements: to reiterate our commitment to reporting facts in a pursuit of truth. A new Monmouth University Poll out today says Americans are concerned, in fact, 77 percent of the respondents believe "fake news" is reported at least occasionally in mainstream media. This is a concern that is shared by Democrats, Republicans and Independents. This poll underscores the importance of our journalistic responsibility effort. We hold ourselves to the highest standards of accuracy and fact checking. · The critics don't talk about *your* journalism awards. They seem disinterested that in 2017 *YOU won* more than 400 awards, including 8 national awards for journalistic excellence. · The critics don't talk about *your audience growth*: many of your news operations have gained audience consistently and steadily in recent years. We are very proud of this accomplishment and it's a story our critics ignore. The February 2018 ratings period was a good one for us with more than a third of our stations gaining market share vs. the previous year. · The critics don't talk about the capital investments and the staffing additions Sinclair has made in its newsrooms: we have expanded news by 92 hours in 16 markets in the last two years and we have added 78 news positions since 2015 date. · Recent critics never mention our innovations -- like Project Baltimore, Full Measure or Circa or other forward-thinking projects that could help us expand our audiences for decades to come. 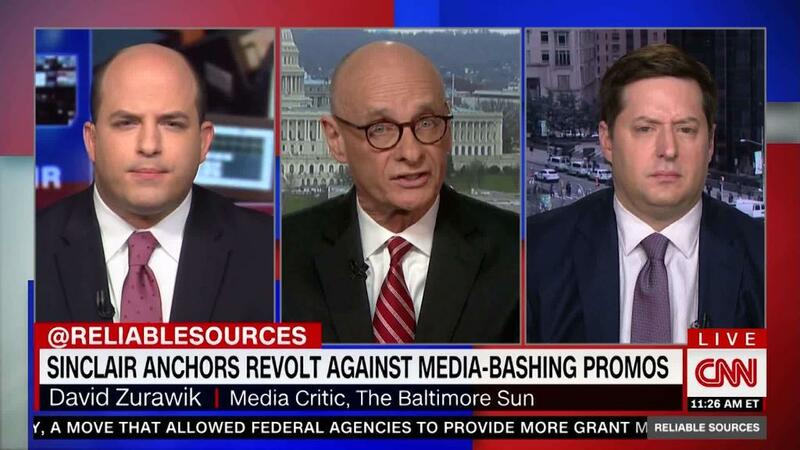 · One thing the critics DO seem obsessed with is the roughly 8 minutes a week of clearly labelled commentary that Boris Epshteyn offers in our newscasts each week. The critics continue to say that his former affiliation with Republicans makes him a propagandist. But they never offer any perspective on Boris' appearances. They never mention that ABC News Anchor George Stephanopoulos ran Bill Clinton's Presidential campaign and served as a Senior Advisor to President Clinton for 4 years. Stephanopoulos now hosts an ABC political talk shows and co-anchors 10 hours of news a week for ABC. That is 10 hours of 'must run' content that all ABC affiliates must carry each week hosted by a former advisor to President Clinton. We have no problem with Mr. Stephanopoulos anchoring these newscasts, but think it is odd that Sinclair critics seem to express zero outrage over this. Critics never talk about Chris Matthews, who worked for prominent Washington Democrats, including President Carter, before becoming an NBC show host. Why don't the critics of Boris' at least offer this context? Why are they obsessed with the 8 minutes a week that Boris gets to offer clearly labelled commentary? Remember, no one is trying to hide Boris' past political affiliations. We label him as a former Trump advisor. We are fully transparent about Boris. · Regarding 2016 Presidential Campaign Coverage: Media reports have mischaracterized Sinclair's coverage of the Clinton and Trump 2016 campaign saying that, "(the) Trump campaign made a deal with Sinclair for favorable coverage." -- Three years ago, our national bureau in Washington D.C. began a weekly project called "Connect to Congress". Each week, when Congress is in session, we set up a camera in the Capitol Hill Rotundas and offer lawmakers a chance to speak directly to constituents in their districts, through our local stations. On many weeks, more than two dozen Democratic and Republican lawmakers participate in these direct interchanges with our stations in their respective districts. Some lawmakers choose not to participate—which is their option—but all lawmakers, regardless of party, are invited. In the spirit of this highly successful Sinclair project, we reached out to both the Trump and Clinton campaigns in the summer of 2016, offering both candidates—and their surrogates--- the chance to speak repeatedly, and directly, to local news viewers, in our Sinclair markets. The Trump campaign responded favorably to the opportunity and, as such, received more direct interaction with our viewers. The Clinton campaign, despite our repeated, documented attempts to arrange such interviews, participated at a much lower level; never once providing the candidate herself for an appearance on a Sinclair station. -- The Chairman of the Ethics Committee for the Society of Professional Journalists reviewed the Sinclair outreach to both campaigns and stated, in part, in December 2016, "After hearing from Sinclair's representatives and viewing emails between the company and former Secretary of State Hillary Clinton's campaign, I don't believe the interview arrangements fell outside what would be considered ethical journalism." Honestly, most of the Sinclair critics don't seem to do their own original reporting. Do you ever notice that a story written about Sinclair from a west coast publication will include a lot of the same talking points—often the same wording--- as a story written a week earlier on the east coast? These reporters aren't producing original journalism; they are aggregating often-flawed-reporting-content published by other media outlets, without fact checking it—or calling us to confirm any of it. By contrast, we have hundreds and hundreds of journalists in Sinclair, who go into the field each day, conduct their own original interviews --face-to-face---and create truly original content for our their local audiences. Your original reporting is our core strength. It's why we are growing and our critics are increasingly becoming obsolete. It's why surveys show news consumers trust you more than they trust the bloggers. Local news is at the heart of Sinclair. Our agenda is to serve our communities by sharing relevant information to alert, protect and empower our audiences. That's our daily commitment. We live it and breathe it --- each and every day. Thanks for all of the hard work and commitment to our viewers. Our viewers appreciate it---and I do too! Please make sure to share this message with your staff."